100% Light Proof: SHINE HAI growing tent includes a removable Mylar floor tray, 100% light proof. The 600D material is tear-proof, and perfect for light blocking and durability. Increase the intensity of your grow lights and retain heat to keep your grow room at the right temperature for your plants, fruits, flowers, herbs and vegetables to thrive. High Quality: The grow tent is supported by strong metal poles, stands stably. The double stitched and durable zippers ensure the durability and long-lasting use. Thick tent material guarantees security and stability. Keep your growing contained, prevent odors and light from leaking out. Easy Installation: SHINE HAI grow tent is very easy to install even if you\'ve never done something like this before. No tools needed. 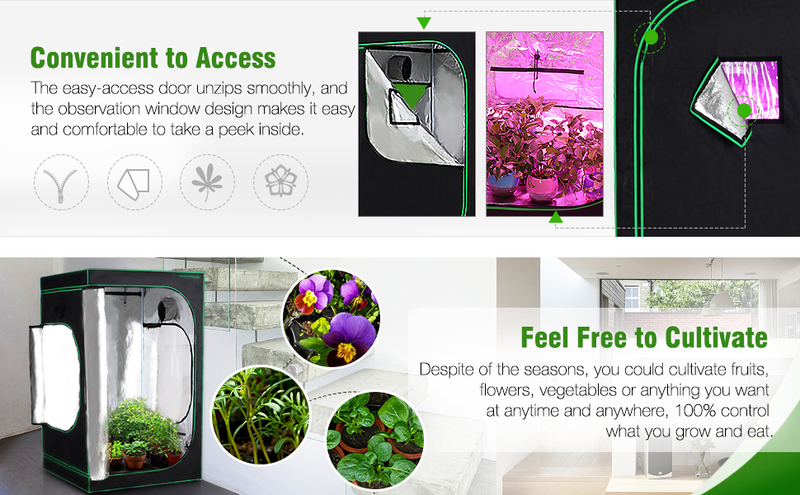 Only spend few minutes to set up your indoor garden in an apartment, condominium, greenhouse, or any rented space. Convenient to Access: The easy-access door unzips smoothly, and the observation window design makes it easy and comfortable to take a peek inside. Convenient to work with your plants and view from outside. Hassle-free warranty: Free 6-month product unlimited warranty is offered to our customers, email us for any query and we will be in touch within 24 hours. Replacement or refund will be provided for your preference. 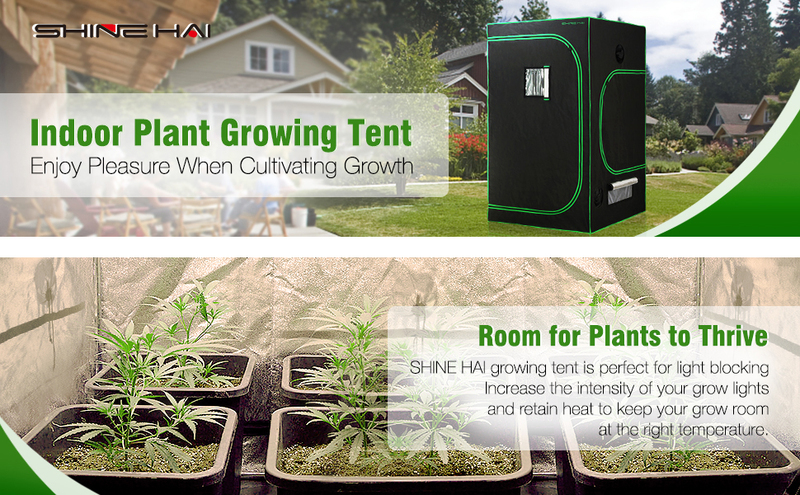 SHINE HAI growing tent is 100% light proof. The 600D material is tear-proof and perfect for light blocking and durability. Increase the intensity of your grow lights and retain heat to keep your grow room at the right temperature for your plants, fruits, flowers, herbs and vegetables to thrive. The unique easy view window design helps you better watch the daily growth of your plants, makes it convenient and controllable. Includes a removable and water resistant Mylar floor tray, it is very easy to clean or wash.
Non-toxic and no-harm, great suitable for growing exotic fruits, herbs, vegetables or seasonal fruits out of season.